Bathroom Decor - Hand painted metal bathroom wall hooks and toilet paper holders - Haitian metal art, Metal Wall Art, Recycled Steel Drum Art > Painted Metal Moon Toilet Paper Holder - Toilet Tissue Holder - 7 1/2" x 11"
Painted Metal Moon Toilet Paper Holder - Toilet Tissue Holder - 7 1/2" x 11"
Hand painted metal moon design toilet paper holder. A colorful addition to your bathroom decor. Couple together with our matching wall hook for a coordinated bathroom design. The toilet paper holder can also be used as a guest towel holder, or others have used it to hang their scarves, jewelry or belts. Hand cut from a flattened, recycled 55 gallon steel oil drum at our workshop in Port au Prince, Haiti. It is then carefully hand painted. Decorative toilet paper holder measures 11" high x 7 1/2" wide. See matching painted metal moon wall hook. 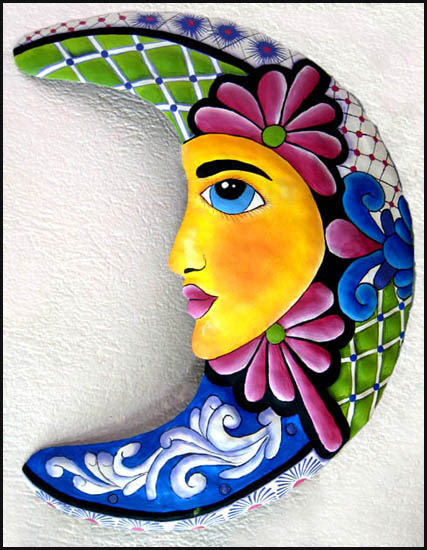 See matching moon wall hangings 3 sizes of moon wall hangings are available.